Vehicle Management and Analysis Specialists in the Air Force are like the auto mechanics of that branch of the service. They schedule and analyze maintenance on Air Force vehicles and equipment, making sure everything is in working order. Although they're dealing with vehicle and vehicle systems, airmen in this job aren't simply grease monkeys. They're working with some of the most sophisticated and intricate mechanical systems in the world, which includes thousands of vehicles. Most of them require unique maintenance, and keeping up to speed with and learning the latest technology and techniques is a key part of this airman's job. The Air Force categorizes this job as Air Force Specialty Code (AFSC) 2T3X7. Vehicle Management and Analysis Specialists supervise and perform On-Line Vehicle Integrated Management System (OLVIMS) management functions, including inputting data into the OLVIMS computer system and verifying its accuracy. They coordinate to ensure the timely repair of assigned vehicles, monitor contract, and warranty repairs and develop long and short range plans and programs to keep maintenance schedules on track. They oversee delayed maintenance, accident and abuse programs and keep track of vehicle historical data and records. These airmen also extract and tabulate maintenance data, and prepare that data for presentations to managers and supervisors. They analyze data for deviations from specific performance indicators and help to develop corrective actions. You'll need to know maintenance control and analysis, diagnostic duties, maintenance responsibilities, maintenance data collection and reporting procedures, and small computer operation in support of OLVIMS. Airmen in this job need a high school diploma with courses in algebra or other mathematics and should complete a vehicle maintenance control and analysis course is mandatory. Recruits interested in this job should score at least a 41 on the administrative (A) Air Force Qualification Area of the Armed Services Vocational Aptitude Battery (ASVAB) tests. After 7.5 weeks of basic training and Airmen's Week, airmen in this job spend 30 days in technical school Lackland Air Force Base. Here they'll gain experience in maintenance control or analysis, quality control, diagnostics or maintenance shop work center, and obtaining parts and materials for use in vehicle maintenance. Additionally, these airmen need to know how to conduct maintenance control and analysis, quality control, diagnostics and how to obtain parts and materials for vehicle maintenance. 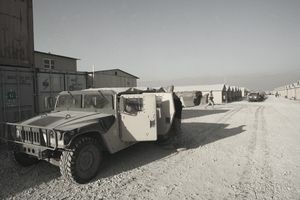 Even though you'll be working primarily with military vehicles, the training you'll receive in this job will make you eligible for a wide variety of civilian jobs working on vehicles and their systems. You'll be qualified to work as a garage mechanic or work in an auto dealership on vehicle maintenance. Any public or private company that owns vehicles that need regular maintenance (and most vehicles do) will have a use for the skills of an Air Force Vehicle Management and Analysis Specialist.